The Domaine Ollier Taillefer was created in 1977 by Nicole and Alain Ollier. The wine estate of Languedoc par excellence, is located in the north-east of the AOC Faugères and extends over 36 hectares. Françoise and Luc, children of the family, have been running the estate since the end of the 1990s. The terroir consists of slopes with steep slopes facing south. The vines are grown according to the principles of organic farming and the harvesting is carried out by hand. After the harvest, the winemakers carry out a rigorous selection of the grapes and put their cuvees in bottles directly at the estate. The Domaine Ollier Taillefer claims a very strong attachment to its terroir of Languedoc. Organic farming, which follows years of reasoned cultivation, is part of this desire to respect the vineyards of Faugères. The richness of this terroir resides especially in shales, which retain water and allow the roots to harvest the minerality of the soil. It produces great wines, balanced, subtly tannic, with great potential for keeping. The Ollier Taillefer estate produces white, rosé and red AOC Faugères wines. These Grands Vins du Languedoc show a fine balance between tannins and suppleness for red Faugères wines. The white Faugères show a deep minerality, while the Faugères rosés are characterized by their freshness and their floral touch. 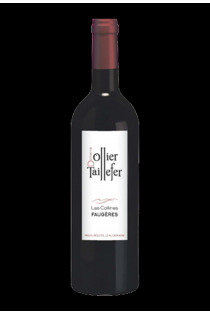 The Grands Vins du Languedoc of the Faugères appellation produced at Domaine Ollier Taillefer come from typical assemblages of the Mediterranean vineyard. For red and rosé AOC Faugères wines, we find Grenache Noir, Syrah, Mourvèdre, Carignan Noir and Cinsault. Roussanne and Vermentino (or Rolle) varieties are used for vinification in AOC Faugères Blanc. Les vignes sont plantées sur des coteaux schisteux à forte pente, et composées essentiellement de grenache noir, carignan noir, syrah, mourvèdre, cinsault pour les vins AOC Faugères rouge et rosé, et roussanne et rolle (ou vermentino), pour les AOC Faugères blanc. Le vignoble est aujourd'hui convertit en agriculture biologique, et c'est au domaine que chaque vin est mis en bouteille et commercialisé.